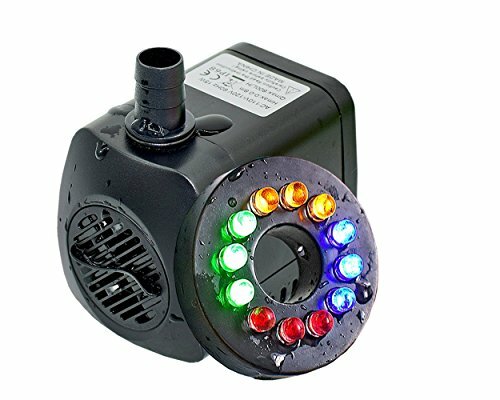 iBuy365 15w 110v 800L/H Electric Submersible Water Pump with 12 Colorful LED for Aquarium Pond Fountain Fish Tank Water Hydroponic | Fountain City Art Ctr. This submersible pump is designed for reliability and ultra-quiet operation to provide years of service. It is anti-corrosive, acid-resisting and durable. This submersible water pump is great for fresh/salt water aquarium, fountains, spout and hydroponic systems. -Suction cups to fit any aquariums. -Long lasting wear proof stainless steel shaft. -Suitable for fresh and sea water aquarium. A clogged or dirty intake screen will generally reduce the performance of the pump. Hence, you must wash away the surrounded debris frequently. If less flow is required, adjust the flow control lever. AC powered electric submersible water pump, quiet operation. Low voltage water pump with 110-120V 60Hz. Maximum flow: 800L/h; Maximum lift: 1.6m ; 15 watts power; Fits 0.5 inch tubes. Suitable for fresh-water, salt-water.This submersible pump is applied in aquarium, fountains, spout and hydroponic.The small size makes the pump easy to clean and hide. If you have any questions about this product by iBuy365, contact us by completing and submitting the form below. If you are looking for a specif part number, please include it with your message.